The Lighted Chalice is our monthly newsletter that chronicles our history month to month, keeping the congregation abreast of the activities within our church and our participation in the greater community. The newsletter submission deadline is the 15th of each month. 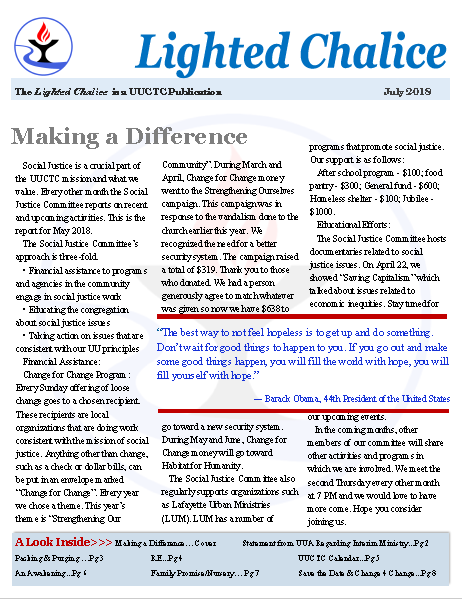 Submit your news via email to: lightedchalice@uuctc.org or fill out this form. 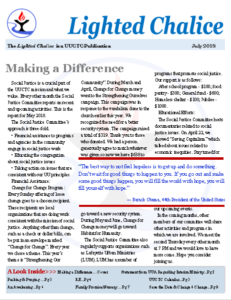 The newsletter is distributed via email the first week of each month. Hard copies can be found on the desk outside the office, in the narthex and at the welcome table in the library. Recent issues of the Meridian Update Weekly Bulletin can be found here. Oct 5 txt pdf Change of format for LC weekly to smaller version plus congregation-supported newsletter.